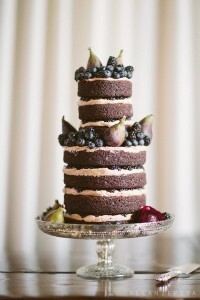 The dark hues of the cake make it perfect for cooler late-fall days, and add a bit of drama to the dessert table. The cake features SEVEN tiers of chocolate cake with light chocolate icing between the tiers. The addition of the figs, blackberries, and blueberries works well with the darker hues of the cake. A few bright flower give just the right pop of color! You can find this cake here. It was created by Lael Cakes.